This weekend, I witnessed both the absolute best and worst acts of sportsmanship I've ever seen. The real surprise was that the best was displayed by a middle-school boy (not exactly known for their good attitudes), and the worst by a bunch of full-grown adults who should certainly know better -- and weren't even the ones competing in the first place. My middle-school daughter had a big cross-country meet on a rain-soaked course in North Alabama. Prior to her race, the boys took the course. It was cold, rainy, and generally not conducive to a two-mile run. As they were passing my location near the finish line, a kid from an opposing team went down hard with a leg cramp. It was one of those where he couldn't even straighten out the leg and you could actually see the muscular knot. I've been there, and it was painful to watch. He tried gutting it out and limping ahead, as he was less than 1,000 yards from the finish. After only about 100 feet or so, he went down hard again, face down in the mud. That's when another boy, from a totally different team, committed one of the purest acts of sportsmanship I've ever witnessed. He stopped, pulled the other boy up, and helped him to the finish line. It took several seconds, perhaps even minutes, from his time. 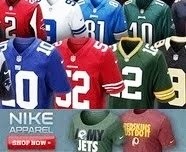 No chance at a win or a personal record. I hope both boy's parents witnessed this. As a parent myself, I would've been much prouder of what he did than if he had gone on and won the race. As a matter of fact, I had to look away and swallow hard to keep that giant lump in my throat from escaping through my eyes. Cut to about 18 hours earlier, when I witnessed the direct polar opposite of that level of sportsmanship, by a group of adults no less. I had to look away then, too, but for a totally different reason. The scene was sickening to me. 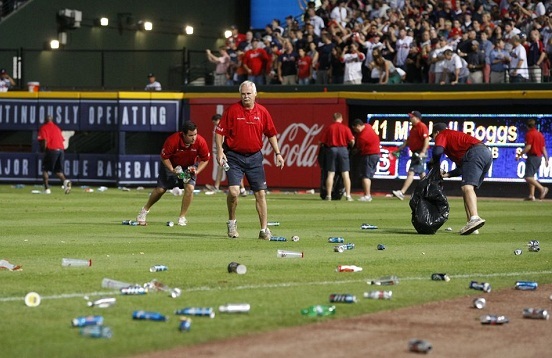 A controversial call in the St. Louis Cardinals-Atlanta Braves playoff game set off a hail of bottles, cans, cups, and various other foreign objects tossed from Atlanta fans. It delayed the game for more than 15 minutes. Now, I've been a Braves fan since they moved to Atlanta back in 1966, so I understand their frustration as well as anyone. I suffered through those hideous seasons in the 70s and 80s, and rejoiced during the numerous NL pennants and lone World Series in the 90s and 2000s. You can debate the call for hours (trust me, I did that all night after it happened). What you cannot debate is the fan's reaction. It was disgusting, embarrassing, and made me ashamed to call myself a Braves fan. The call was technically correct. It fit the criteria of the infield fly rule (don't reply if you disagree -- I've fought that battle enough already). What it didn't do, was uphold the spirit of the rule, which was written to protect the offense from an infielder intentionally dropping a pop-up and creating a double play. From the location of the shortstop on the play, intentionally dropping the ball and turning it into a DP would have been nearly impossible. That isn't accounted for in the rule, however, so the call was correct as the rule is currently written. Feel free to debate if the rule should be changed. I've thought for years that it should (and have an opinion of the best way to do so, if you want to hear it). For my point, however, that is irrelevant. Even if the call was completely wrong and Atlanta was jobbed out of a win, acting like a 13-year-old is uncalled for. Wait, my first example was of how 13-year-olds can act -- if they are good sports. Come to think of it, maybe they should have acted like 13-year-olds after all. At least like the one that apparently understands sportsmanship better than Braves fans do. Nice post. Thanks for sharing the part about the kid at the cross country meet. Maybe there's still hope for humanity after all. Atlanta got screwed, but the fans took it too far. Horrible call, but Atlanta would have probably lost either way.